Some of you may remember a while back when I posted a call for radical doulas. A woman (who I will call J) had reached out to me because she was having real difficulty finding a doula for three reasons: 1) She was serving as a surrogate for a gay male couple 2) She had had a “selective reduction” of the resulting twin pregnancies to just have one child 3) She wasn’t sure if she would forgo an epidural. This is quite amazing timing considering the doula article from Sunday’s NYTimes. It shows that yes, there are some doulas out there who allow their personal beliefs about lifestyle as well as birth choices to direct who they work with. 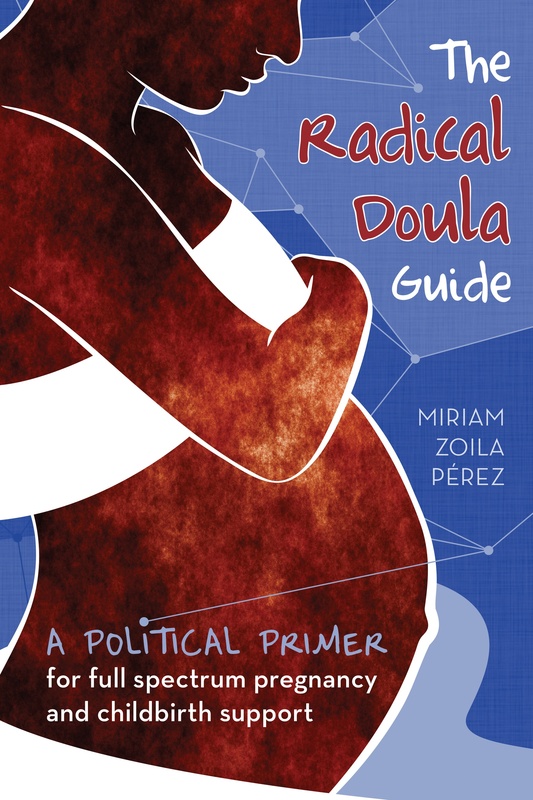 But the overwhelming response to my call for radical doulas also shows that there are just as many (if not more) doulas who are willing to support all sorts of women with all sorts of birth preferences. J was awesome enough to share her birth story with me and you all will be happy to know that she eventually found a great doula who supported her through her birth. Her story made me tear up, and reminded me why I do this work (and why I bother fighting anti-doula ignorance in the blog world too). I don’t know if you remember me but a while back I wrote to you to ask for help in finding a doula for when I gave birth to my surrogate child. After I found a doula I told you I would update you after I gave birth. Well, my surro-child is here! He was born on Feb 12, two weeks before his due date. My doctor felt that it would be best to induce labor since my blood pressure had been creeping up slowly over last month of my pregnancy. He wanted to err on the side of caution and I was ok with that because I knew the baby’s dads were starting to get nervous. Thank goodness for my doula! I was started on pitocin around 8 AM and she got there at 10 AM just as I was starting to feel contractions. For the next 8 hours she would only leave my side once and that was just to go to the bathroom. She helped me through every single point of what ended up being a hard, painful and occasionaly scary labor. At one point in my labor the baby’s heartbeat started to drop and my doula was the one who got me to move into different positions just in case the baby’s cord was getting pinched. Turns out she was right! After I moved around a few times the baby’s heartbeat was just fine. I wonder what would have happened if she had not been there to suggest something as simple as changing positions! At another point my doula rubbed my back for two hours straight. She always seemed to know just where I needed to be touched. If I was tensing up in my back or shoulders she would gently rub them to remind me to relax my body. She also seemed to know when not to touch me. If I was tensing up my face she would remind me to feel the contraction in my belly, not in my face. Sounds like a no-brainer, I know, but just having her say those things helped me make it through. Pitocin is evil, that’s all I can say about that. At one point in my labor the pit was turned off and almost immediatly my contractions became half as painful as they had been. Unfortunatly they also became somewhat erratic so the pit got turned back on. Right away they became twice as painful and much longer. At one point I really thought I was going to give up and ask for an epidural but my doula convinced me to just try to make it through one more contraction. To my suprise I was able to make it through one more. And then another. And another. And another. And then all of the sudden it was time to push! 20 minutes later my surro-child was in his daddies arms and I had done it! I had given birth the way I had hoped to, without any pain meds and with an amazing, wonderful support team. After I gave birth and was being stitched up (just a small tear) my doula held my hand and told me how proud she was of me. I told her I couldn’t have done it without her and I really, really meant it. I feel like her being there empowered me and gave me the strength I needed. Now I can’t say enough about how wonderful doulas are. I tell everyone I know who is having (or planning on having) a baby to get themselves a doula. Having my doula there was such a gift and I will never forget her support, kindness and compassion. Thank you again Miriam for letting me share my story with you. Your kindness helped to reassure me that finding a doula was the right choice for me. This made me happy. Thanks for sharing! This is a really great story! I’m glad that she was able to find the best birthing plan/choices for her. nice letter. i’m an ob in an nyc hospital, and we often have patients show up with doulas. the only thing that rubbed me the wrong way was when the mom in the letter writes “who knows what would have happened if she hadn’t been there” referring to the doula moving her into new positions when the baby’s heart rate went down. Um – exactly the same thing? every doc and every l&d nurse know the first manuvers you do for heart rate changes are moving the patient – right side, left side, all fours. usually that does it. but, if it stays down, you try another monitoring method like a scalp electrode to make sure you are actually measuring the baby heart rate – only then, if the heart rate is definitely persistantly low do you move to expidite delivery by whatever method is most appropriate. Thanks for that perspective Rebecca, I would love to have more OBs commenting on this site. In J’s defense, I think while that is the standard practice for OBs and nurses, it doesn’t always happen. We all know that different practitioners have their own techniques, as well as the demands on hospital staff (understaffing, overworking). Also what a doula can do is prevent panic mode from setting in for the birthing mother, which i have seen happen when something like fetal heart decelerations are seen. It’s easy for everyone to start freaking out, including the practitioners and the mom. But ideally its a team effort, with each player contributing in a unique way!